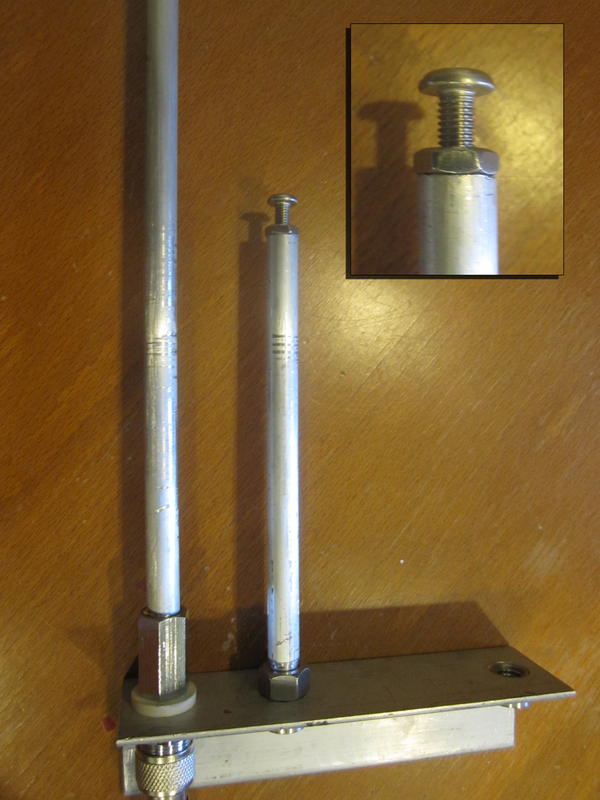 I’ve constructed a 144/440 Dual band Open Stub J-Pole Antenna. I saw the plans for this on the internet (link to plans) by Allen Lowe (N0IMW). Since I had a Metal Fabrication background, I thought this would be an easy build. I understand that everyone else in the world uses Metric, You can convert these numbers to MM and use 10mm aluminum rod and thread for the elements. However I am not sure about the SO-239 adapter. I’ve read that it can be difficult to obtain the adapter in Europe. Any EU/Metric users, please help me out and give me details on what you did. (Update 12/2018) Radio-Shack has since closed and the SO-239 adapter I listed on my blueprints are no longer in stock. 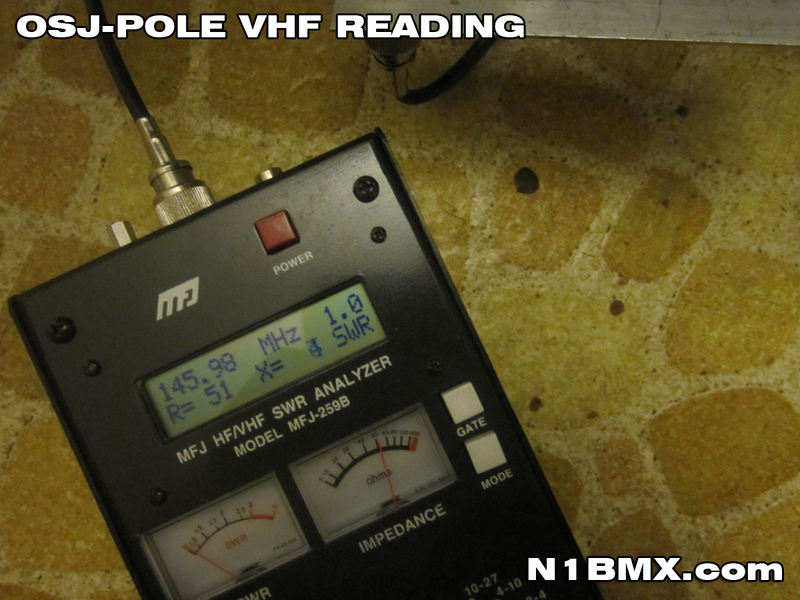 You can find equivalents on ebay, amazon and other amateur radio or CB supply shops. It’s known as a “SO-239 to 3/8″-24 Adapter”. There are some variants so please make sure it appears the same as the one in my blueprint. You will need to check the diameter of shoulder on the insulation washer and adjust the size of the large to to make sure it fits. Here is a Step-By-Step video with me stammering on. Getting a little bit better every time I make a video. It was a really fun and quick build. Plus it works okay. It’s no Diamond X510. What else do you expect for around $20 in parts? I love it. If for whatever reason you can not build this. It is manufactured by the designer of this antenna and has them for sale on his website for a reasonable price. 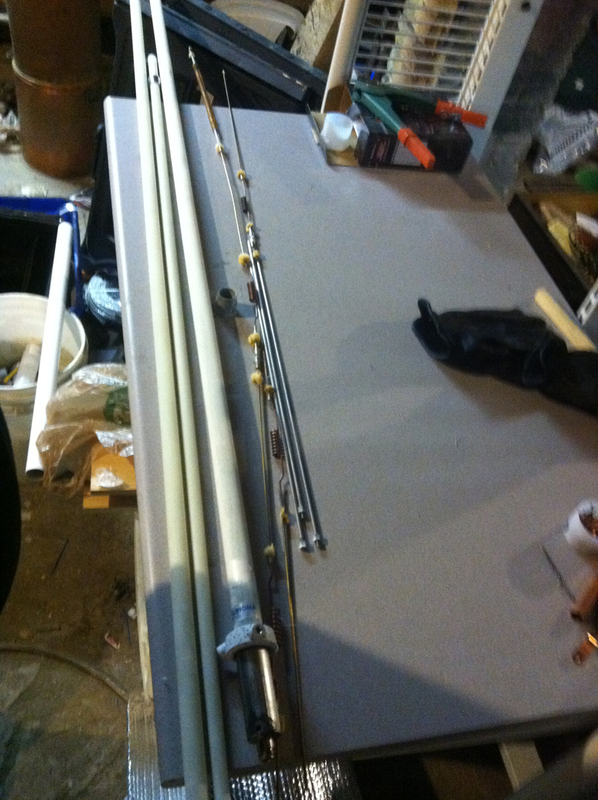 So check out ARROWANTENNAS.COM for the OSJ and other quality crafted antennas. Due to many e-mails, I just want to state that I do not and will not manufacture these antennas for sale. I think those sold at Arrow Antennas are well worth price. 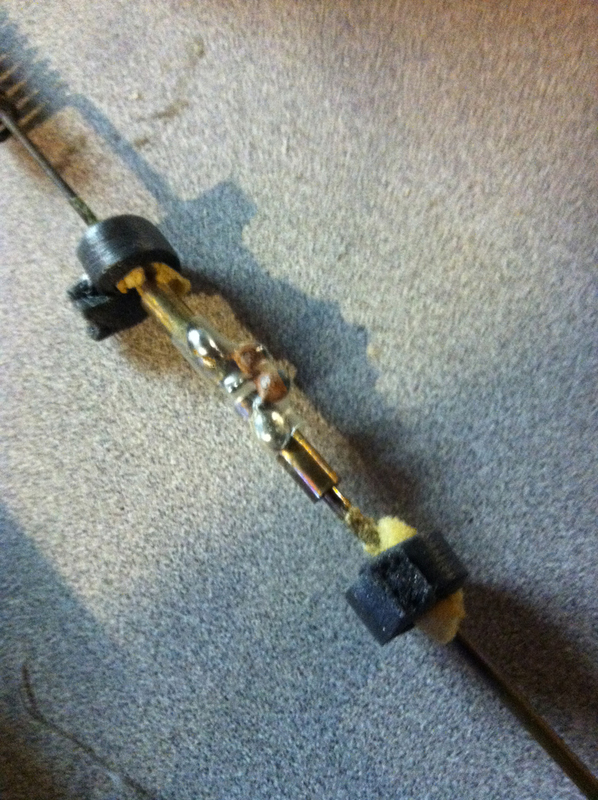 Some people were curious as to what the gain and pattern is of this antenna is. Arrow Antenna basically said they weren’t posting figures as competitors use gain as a marketing ploy and inflate numbers. However they did publish the patterns. I’ve tried to model the antenna in 4NEC2 without much luck. What I was inputting into NEC was nothing near comparable to what I and some others have measured. Thankfully I wasn’t the only one who was having issues modeling a J-Pole. 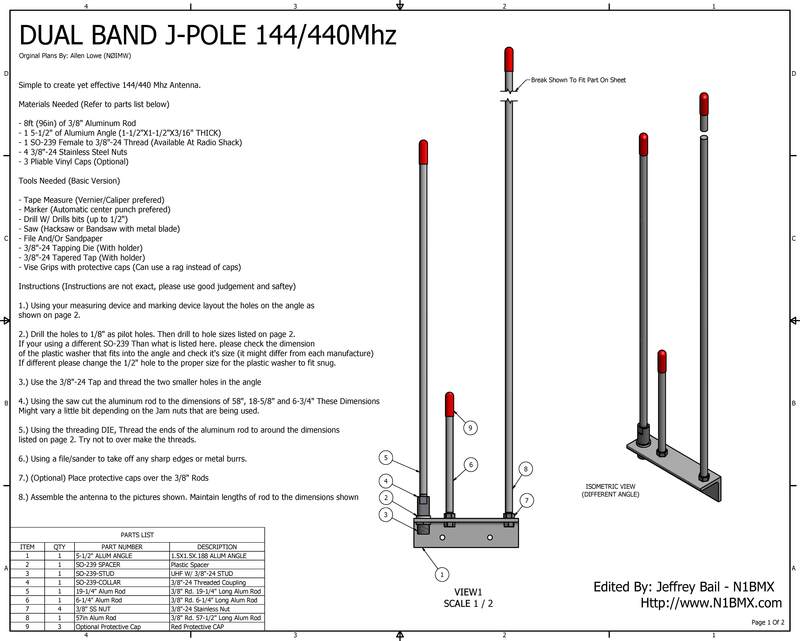 C Bronson Crothers (AA1ZB) has talked about modeling the J-Pole and wrote quite a bit about it. Carol Milazzo (KP4MD) took it a step further and modeled the Open stub J-pole. She modeled the antenna in various situations (mounted to mast, free space, free space with ground) and even published the NEC files for all to see. I’d strongly suggest to check out her website for the NEC files and other information that has helped me along in the hobby. I took the files and messed around to see what happens. Depending on the height about ground, your looking at anywhere between 3-7dBi (or .85dbd-4.85dBd) gain according to NEC Data. In the perfect world, if that antenna was fed with 50 watts, it would effectively radiate anywhere from 60 to 150watts. But that is in the perfect world which we are not in. Things like the type and length of coax used, connectors used, nearby structures, type of ground and a bunch of many other variables factor into how well an antenna performs. 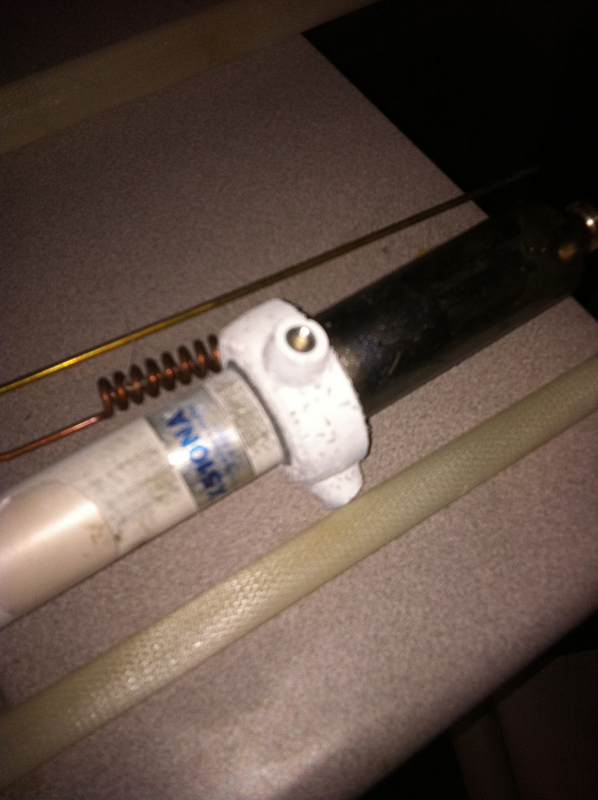 In the antenna gain world you will see dBi and dBd depending on the manufacturer. You just don’t measure Decibels. In this case it’s used as a reference against either an isotropic antenna (dBi) or against a dipole (dBd). So if you see antenna readings in dBi, it’s in reference to a theoretical perfect antenna that radiates evenly in every direction. 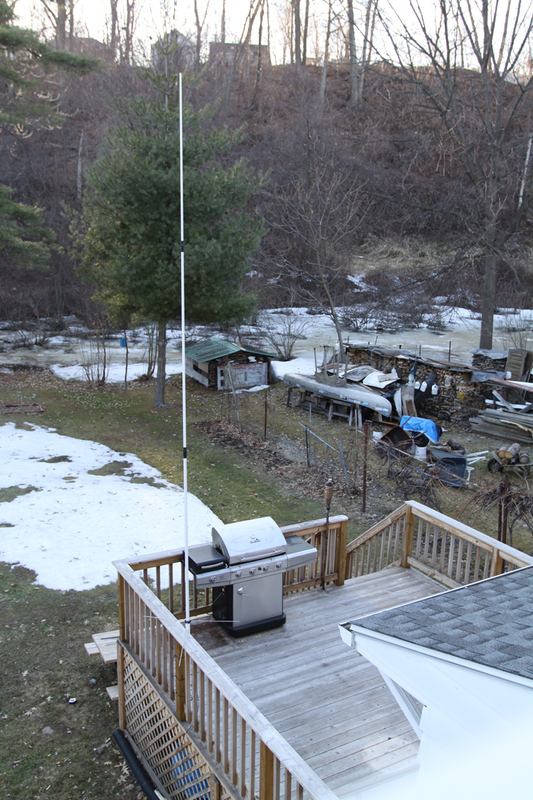 If you see dBd, the antenna is being compared against a half-wave dipole antenna. 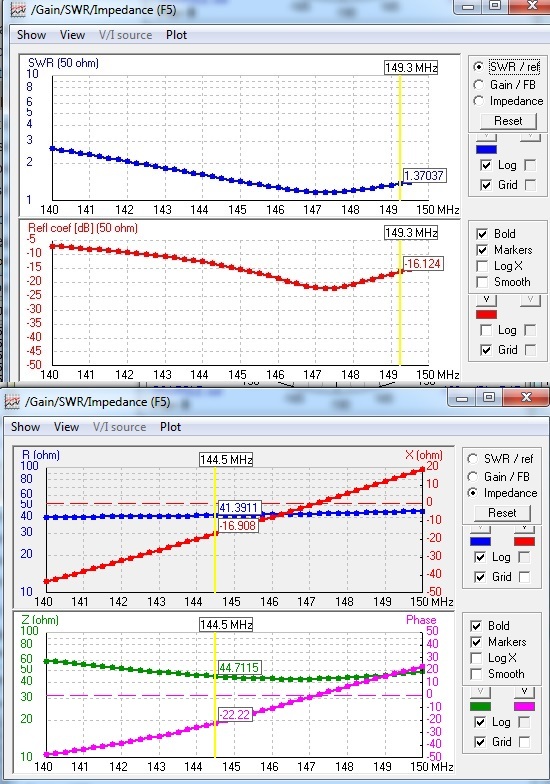 The difference between dBi and dBd is 2.15. dBd is comparison against an actual antenna. Some hams confuse dBi and dBd and some manufacturers confuse the buyer by not telling you the reference (It has 9dB of gain!!). 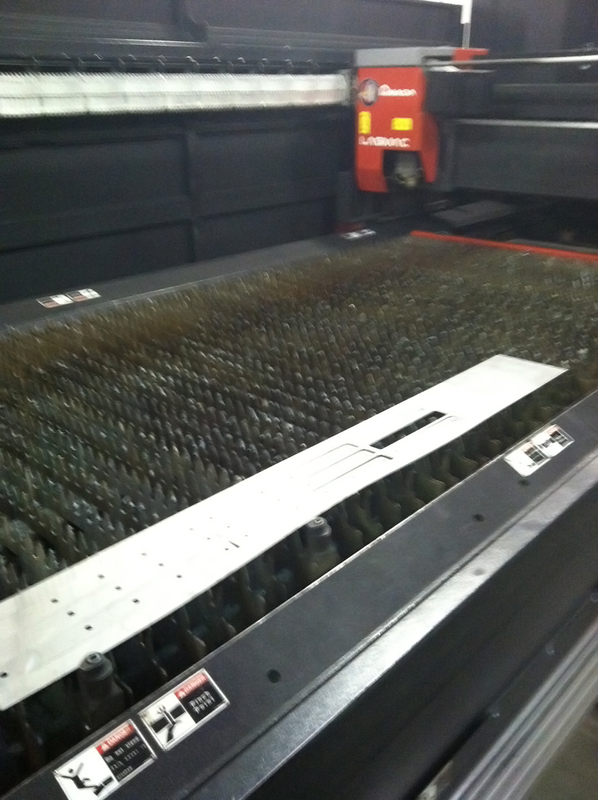 Most manufacturers use dBi as it’s a bigger looking number. 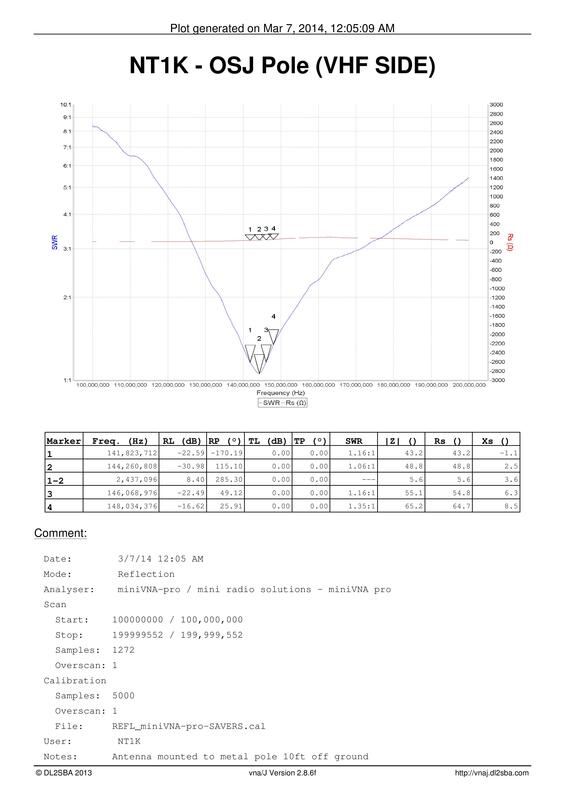 Just subtract 2.15 and you will know the gain compared to a half-wave dipole. This is a 3-d wireframe of the pattern (in gray) with an outline of the vertical polarization. The antenna is pretty much Omni-directional Horizontally. Vertically, the focus of energy is between 15 and 85 degrees. 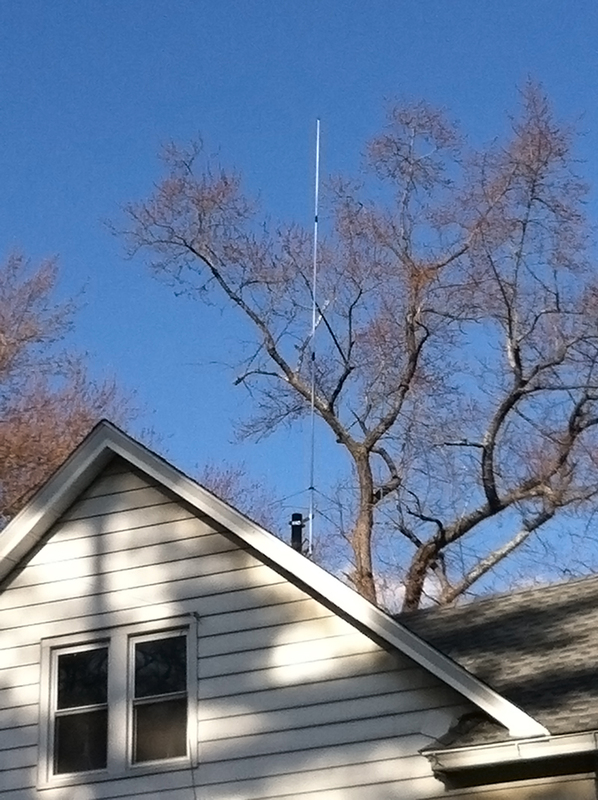 It would be ideal to mount the antenna above the roof line or at least 10ft off the ground as the signal radiates more from the side. This antenna wouldn’t really be ideal for Sat use as there is a huge null and less gain when looking towards the sky. 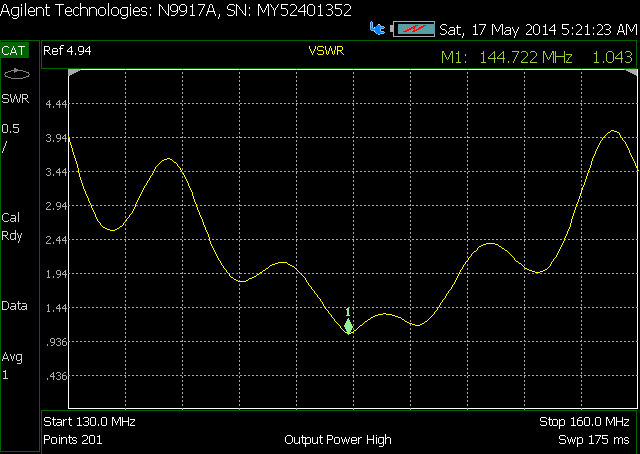 Here is what 4NEC2 Predicted On the VHF Side. 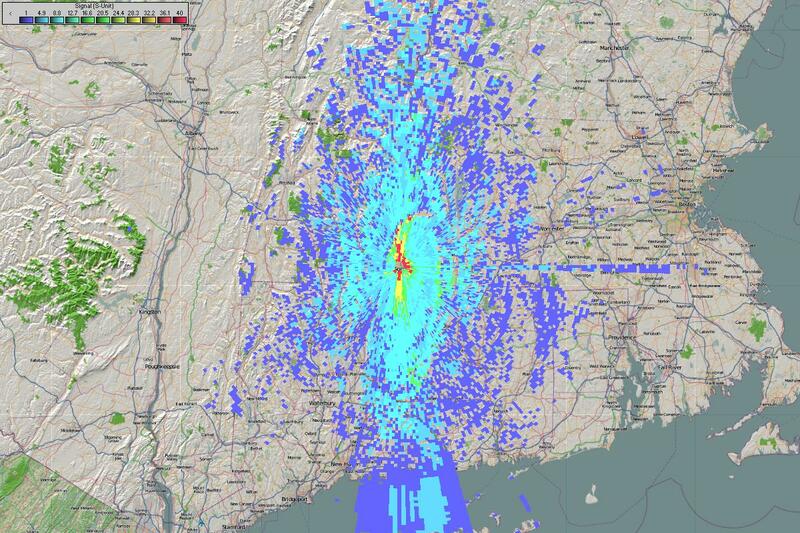 By looking at the blue line towards the top of the image, you will see that it has excellent SWR throughout the 2M band. 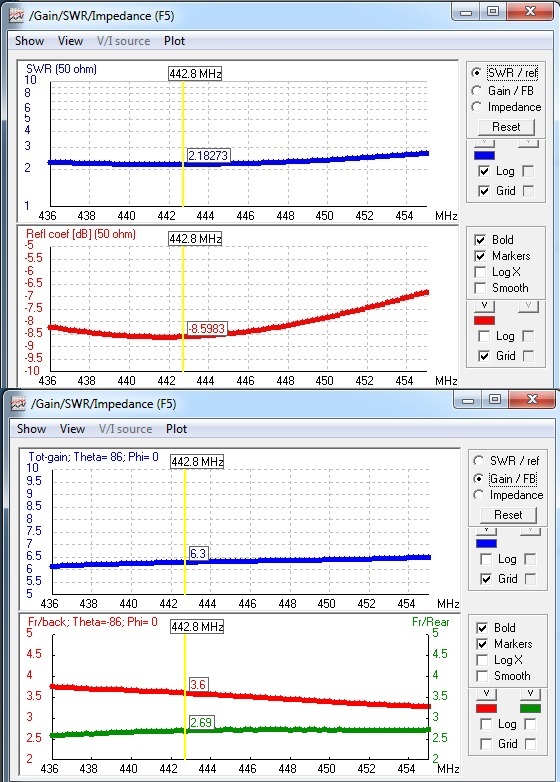 Looking at the green line, you will see that the impedance is also decent. 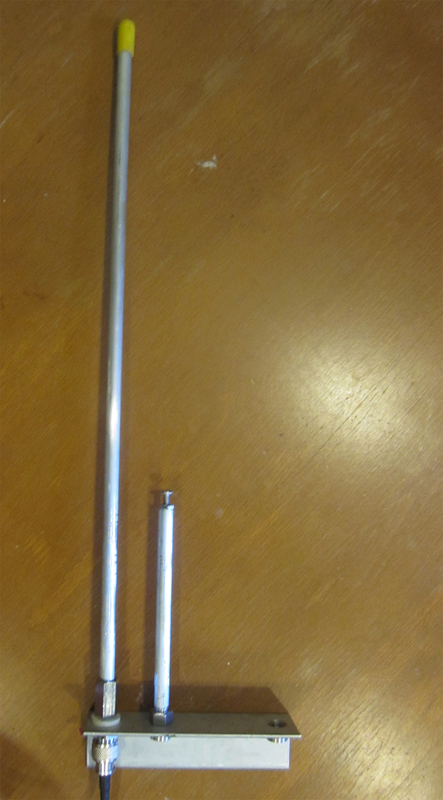 The UHF Side of the antenna doesn’t look so great when compared to the VHF side of the antenna. But it’s still useable. Once again these are predictions from the software. It’s doesn’t mean that’s how the antenna is going to exactly perform. But it will give you an idea of what’s going to happen. Let’s do some real measurements. After making various antennas, I felt I needed some kind of analyzer of my own. I purchased a mRS MiniVNA PRO. 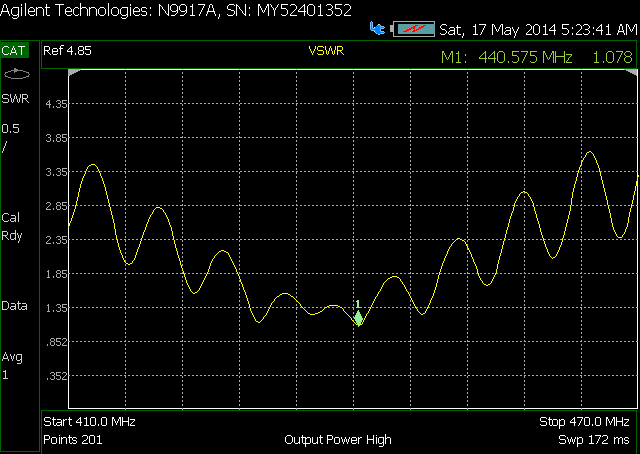 It covers HF/VHF only but it give me a better idea of how the antenna is performing throughout the band. 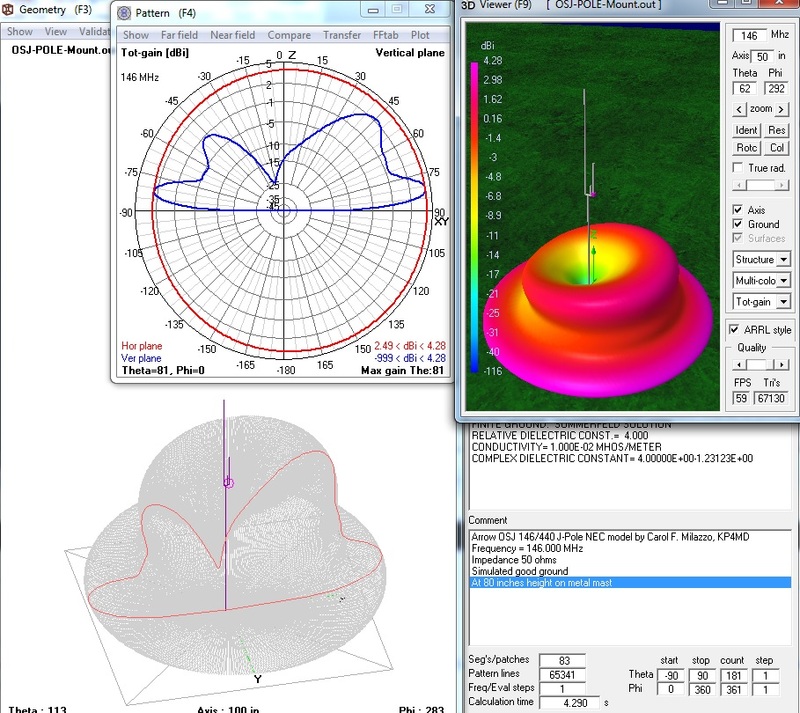 Even though I did not design this antenna, I often get e-mails from people who had trouble with this particular antenna. I helped troubleshoot a lot of the issues and found out that the majority of problems were in result of the person not following the instructions as listed on either my or Mr. Lowe’s prints. Most common mistakes were people cutting the lengths short or people substituting the materials called with others. 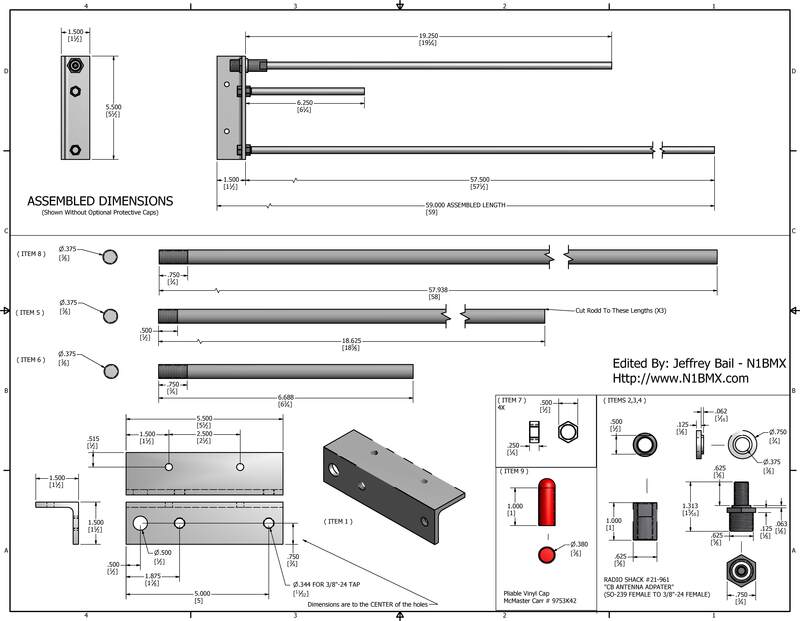 For those living in the rest of the world, I know you might have trouble trying to find SAE/Imperial material and will substitute 3/8″ with 10mm rod and hardware. I am not sure if they make a Metric SO-239 to 10MM adapter. But I’ve heard from multiple people that it work with 10mm. Another common mistake is when it comes to testing. 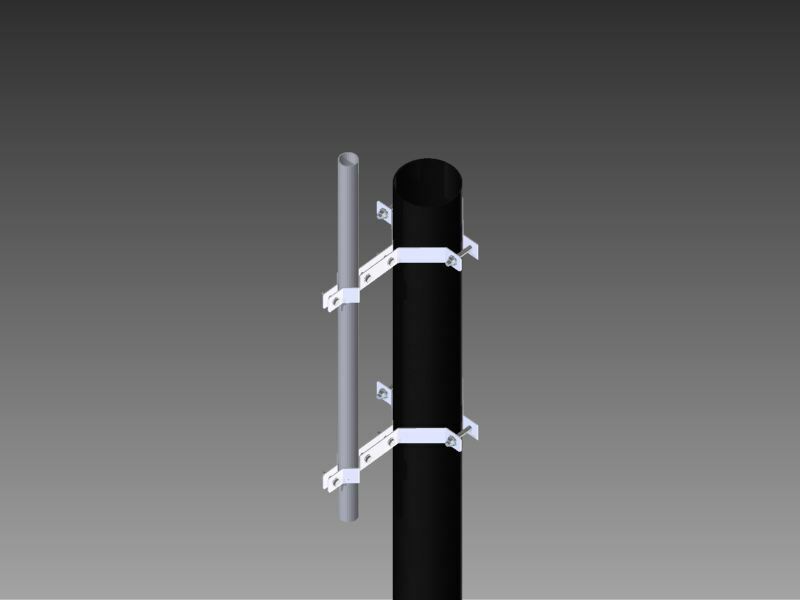 Testing should be done with the antenna installed or at least mounted to a pole to simulate an installation. Some people were laying the antenna on the ground, holding it with their hand or placing it against large metallic items (like a car) which will produce different readings. You won’t know how it performs SWR wise until you have it installed. Even though it’s rare, be prepared to install and remove the antenna multiple times while taking readings. There is an issue which I haven’t touched on. Much care should be taken to prevent water from getting into the threads of the SO-239 adapter or in the adapter itself. Even more so if you live in colder climates where water can freeze and expand. If you are unsure about cutting the elements to the proper length, it’s best to cut it a little longer and grind or re-cut the elements. It’s better to have elements that are too long instead of being too short. If you happened to cut it too short, it’s possible to use a coupler to adjust the length of the antenna but I would suggest re-making the element in question. I like when people send me their creations. Some follow instructions exactly while others are creative and use what they have to make a working antenna. 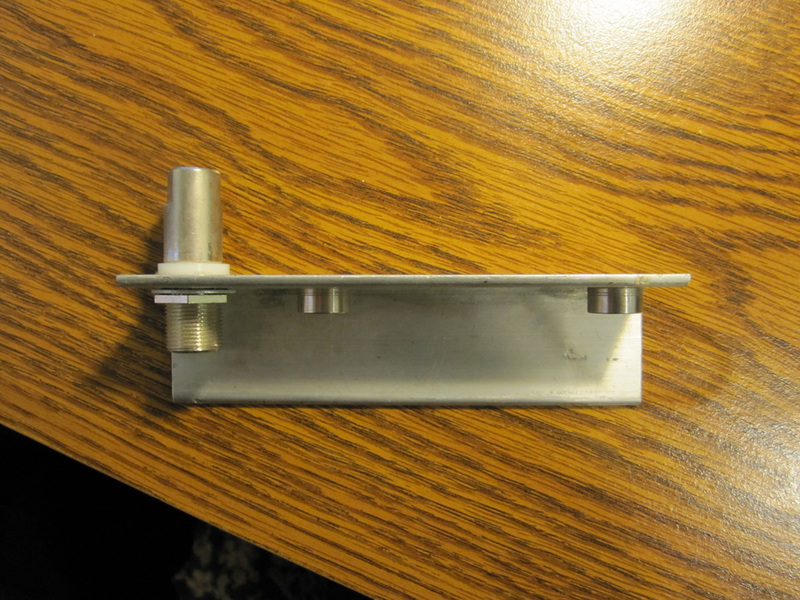 Here are some links to those who also made the antenna. Maybe they can provide some insight into things I forgot. 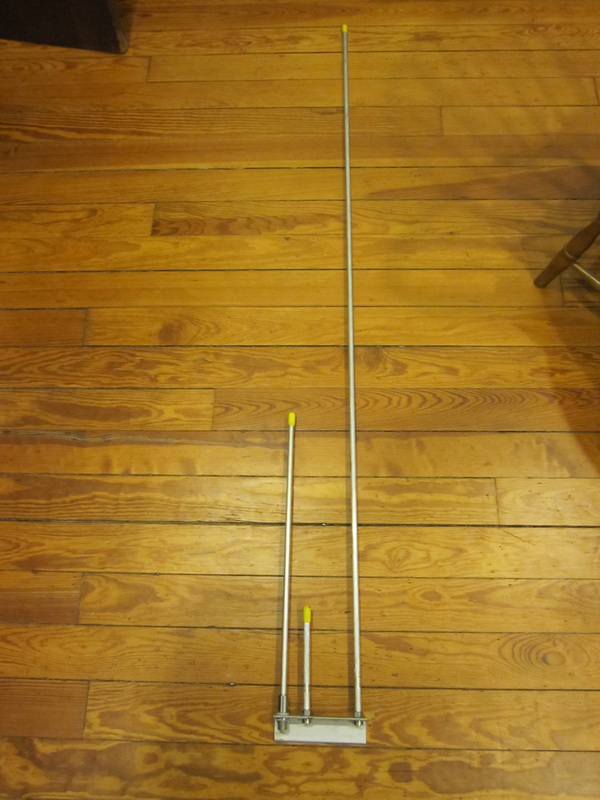 F6FZU’s OSJ-Pole – French reader who managed to make the antenna using metric tubing as well as different materials while getting decent results on the analyzer. The one thing that stands out is that the angle he using to mount the elements is made from Galvanized dipped steal. I would avoid using steel at all costs. It appears he is taking steps to weather proof the steel. Michigan Amateur Radio Alliance (MARA) – Couple of their club members (KD8PVS & KD8UCP) decided to build the OSJ-Pole using my prints. They did a very nice job and they also found another source for the vinyl caps and provided clamping and installation photos of their antenna. Nice job! 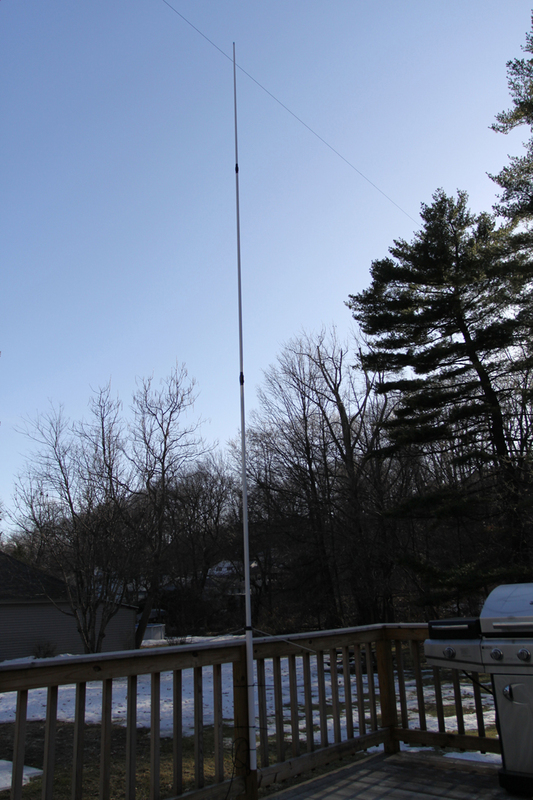 KI6RT’s QRZ.com Profile – In Jon’s profile, he built the OSJ-Pole. He manged to run the antenna through a high end analyzer showing SWR results of both the VHF and UHF portions of the antenna. 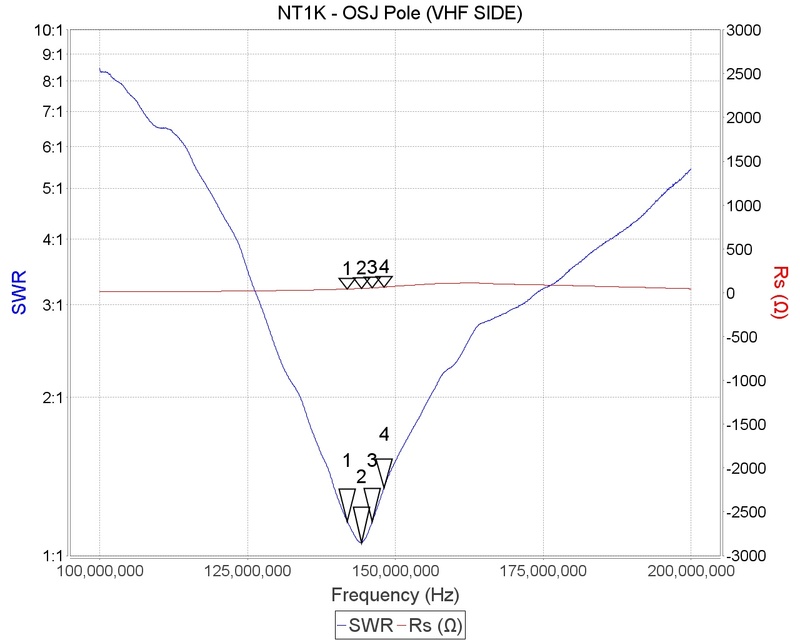 It shows that at least the SWR is decent in both the bands.